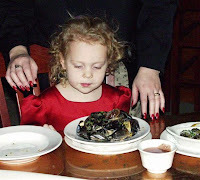 Talking with Chris Surrusco at Granville Moore's about his plans for putting mussels on the menu made me think back to 2000/2001 when I was a part-owner of the (ultimately unsuccessfully) revamped Sissons. Our chef Bill Rothwell —aka Rollo, a roller-skating champion in younger days— would prepare our mussels steamed in gueuze - an expensive, yet wonderful "1+1=3" cooking ingredient. It proved to be our second most popular dish —by a whisker— after our rockfish (striped bass). Bill steamed the mussels with gueuze (Lindemans Cuvee Renee, to be precise), creating a broth with fresh herbs and a bit of butter. Customers would invariably ask for more bread just to sop up the broth. And just so that you know: steaming does remove the alcohol! Overheard on the street has been that another new Belgian-style brasserie is set to open soon in Washington, D.C. 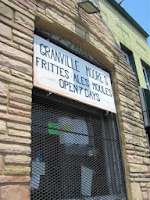 So I stopped by yesterday at Granville Moore's Frittes, Ales, & Moules - near the intersection of 12th and H Streets NE - to see for myself. 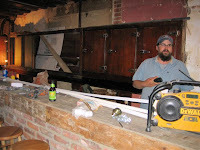 General Manager Chris Surrusco was hard at work refinishing his back bar. Chris, who designed the cask system at Rustico in Alexandria (and where until recently he was also the beer manager), says Granville Moore's will be, what he feels, a true Belgian brasserie should be: an intimate, unpretentious place with Belgian beer ascendant and inexpensive food. 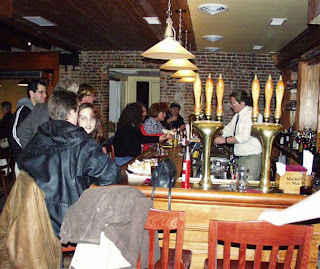 Chris want you to think of Granville Moore's as a smaller, cozier, less expensive, and much closer-to home, Monks Café (a Belgian bistro in Philly). Ambitious indeed, but Chris and owner Joe Englert (Temperance Hall, Lucky Bar, Big Hunt, etc.) could be the ones to pull it off. When open, it will join the more restaurant-like Belga Café and Brasserie Beck - which itself just opened - as the three principal Belgian-themed brasseries of Washington, D.C. proper. The place currently looks likes a partially rehabbed row house but a lot of work has already been completed, and several contractors were on-site when I was there. 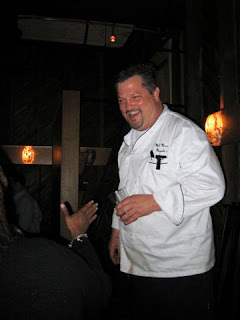 Inspections begin later this week, and Chris expects a mid to late June opening. Decor-wise, the ceilings will retain their joists and beams exposed, the walls, their brick and plaster remnants exposed. There is a small back patio. There will be two bars, one downstairs - the dining area, with a 4-tap draft system - and one upstairs with bottles only, but an extensive collection nonetheless. Stella Artois will be one of the 4 beers on tap, and, at least at first, De Koninck on the second tap. The other two taps will constantly rotate, thus ensuring an eclectic mix of Belgian beers. Belgian-style beers from US craft breweries are NOT currently on the agenda. Chris' kitchen will offer simple, well-prepared brasserie fare: steamed mussels (moules) available 5 ways, fries (frites), and a few grilled sandwiches. I was pleased to see that he is double-frying the frites after the traditional manner. First at a slighter lower temperature to thoroughly cook the fries without burning them, and then a second shorter dip in a higher-temperature fryer for a finishing crisping. The seafood and other ingredients will be sourced locally, organically, and for sustainability. Chris seemed especially proud that there would be no television sets. He said Granville Moore's will be "a hangout for locals, for Belgian beer geeks, for bike couriers, for hippies, for Capitol Hill types, for anyone in search of a true brasserie experience." 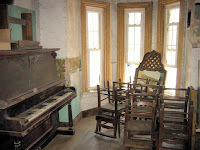 He has plans for live jump-swing piano in the upstairs bar. He'll have no no cask beer, but, Chris an avowed hop-head, said he will offer a few hoppy craft bottled beers. Granville Moore's is located right next door to the the hip H Street Martini Lounge, itself part of a revitalization of the H Street NE corridor, which some now refer to as the Atlas District. But Granville Moore's can count as its further-down-the-street neighbors several long-time and successful H Street establishments. I lived nearby, nearly fifteen years ago. So yesterday was a nostalgic trip for me, visiting the old neighborhood. For public transportation from Union Station, take the D8 Metrobus east/Washington to 1238 H Street NE. So who was Granville Moore? A physician, he had long operated a pro bono and low-fee health clinic at that address. Older residents of D.C.'s Trinidad neighborhood still remember him well. More photos of the pub during construction. Early in May, Yahoo announced that it is discontinuing its free Yahoo Photos. I've been using that service as backup storage for all of my photos and as the linked-to-location for many of the pictures referenced on my blog postings. I must be a fogey: more people prefer such services as a networking site - sharing of their photos - than as a data backup storage. And more of these more people are far younger than I. So, I've begun the process of manually transferring my photos from Yahoo Photos to Flickr (recently purchased by Yahoo). During this period, some links to photos (both on this blog and on my home website - thomas.cizauskas.net) may not function. I do hope - although I'm not confident - that Yahoo will offer an easier, quicker method to effect the transfer. This process will also create a strange scenario. As I edit older posts with new links, these older posts will appear as new posts on many blog readers (also called aggregators, these are programs that are used to read blogs). One moral: always back up your data. My photos and scanned pictures are saved on a dedicated external hard drive, on discs, and, soon to be, on Flickr. My music is saved on a dedicated external hard drive and on-line via the Oboe music locker from MP3tunes. I back up all of my data onto a dedicated external hard drive and on-line with Mozy. 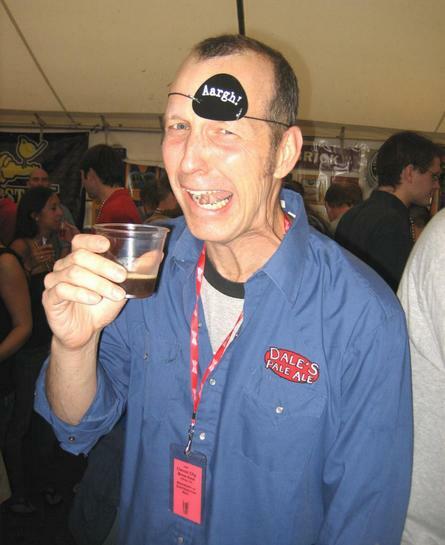 Word is out that Bill Muehlhauser, hard on the heels of his agreeing to a partnership with Anheuser-Busch, is ceasing brewing operations at his Annapolis, Maryland brewpub - Ram's Head - while keeping open and expanding the music club itself. News of stopping the on-site brewing comes just two months after Mr. Muehlhauser announced a partnership with Anheuser-Busch. The local brewer and the beer giant created the Coastal Brewing Co., which joined Fordham Brewing's beers with Anheuser-Busch for marketing and distribution along the Eastern Seaboard. In a March interview, Mr. Muehlhauser, now also managing partner for Coastal, told The Capital that the small microbrewery in Rams Head would continue operating under Fordham, "making the same beers that it's always made." The Rams Head Tavern was not part of the Coastal deal, but as a result customers will now be able to order Old Dominion beers at each of the six Rams Head locations and can expect to see an increased presence of the Fordham brand in Maryland, Virginia and Washington. D.C.
My opinions of the Fordham Brewpub beers have waxed and waned over the years. I think the quality of the beers reached its zenith under Ohio and Maryland craft beer pioneer Allen Young and his immediate successor at the pub. 1) Commitment: Early Sunday bike ride to Vietnam Veterans' Memorial to pay silent tribute to all veterans, past and present. 2) Music: Roy Harris' Third Symphony. and, of course, Clipper City's Red Sky at Night Saison. 4) Meal: Grilled marinated vegetables. I'm using the George Forman grill; I'm just not into the mega-grill thing and working over heat while under a hot sun. Combine all ingredients and pour over vegetables. Marinate at least one hour or overnight, turning periodically. If you're using an outdoor grill or hibachi, place the veggies on aluminum foil which you've perforated with many small holes. Using kabob skewers works as well; just watch out for charring. 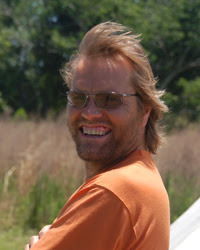 My brother Rich Cizauskas participates in hang glider races. I'm never certain of the exact terminology or correct phraseology. But, I do know (having been corrected on several occasions!) that a hang glider is NOT the hang glider pilot himself but the vehicle he/she uses to hang glide. And the verb to fly is often employed in place of to hang glide. Here's a recent profile of Rich at such a competition. You know the scene: the person next to you, with their LOUD cell phone voice, mentioning personal details which you would rather not hear. I once overheard a man, while we were both standing in a store line - a very public place - ANNOUNCING his credit card number into his cell. And you know the aural assault: elevator music everywhere, and equally annoying, the VERY LOUD music in bars and restaurants. Whilst a little stylish background music in an empty bar, early in the evening, can evoke a sophisticated, relaxing atmosphere, the quantity of naff piped music screaming at us today has got completely out of hand. Not only is there too much of it, it is usually ludicrously loud. Try as one may to block as much of it out as possible, this creeping menace was forcibly brought home to me the other day when I walked into one of my favourite traditional London pubs, the Three Greyhounds in Old Compton Street. I was almost knocked unconscious by the sheer sonic force of the pulsating ‘music' which was causing people literally to shout at one another. And I do mean literally. No it bloody isn't. I ordered my drink (I had to repeat my order twice as he didn't hear me) and I then stood outside with my glass of wine (£4.10 for the honour), seething. It left me feeling utterly depressed at the way yet another decent pub has succumbed to this sonic horror. The frustrating thing is that the customer has no say in the matter. I am sure that almost everyone in that pub would have preferred the music to be at least turned down (and I know, for I asked). And if it were turned off, people would hardly notice. You can see the truth of this when a piped CD comes to an end and the loudspeakers, joy of rare joys, fall silent: people simply go on chatting just as happily – if not happier – than before. No one ever says, ‘Oh no, the music has stopped!' Ever. Background music is almost always unnecessary. It is the chit-chat of people that creates an ideal buzz and ambience. All that loud music does is raise stress levels. It is counter-productive to its intended effect, that of creating an atmosphere that stimulates sociability. Maybe ‘cool dude' barmen like to skip along to it but pubs should be designed for the pleasure of the customers, not the amusement of bored staff. Let music assault the ears of those who enter dance clubs, but spare the rest of us – please! The same goes for the terrible music inflicted on us in aeroplanes, the visual pollution beaming busily from TVs in pubs (any pub with a TV screen should automatically be boycotted), radios turned to list pop stations in taxis, and that most vile of aural and general mental tortures: iPods and mobile phones used on trains and busses (in the latter case obligatory even if the journey is to last no more than five minutes). These crimes incite one's most base and murderous instincts. Being forced to hear the monotonous tinny beat of crappy repetitive music emanating from an iPod, or the droning, vociferous voice of someone on the phone, can ruin an otherwise pleasant journey for the majority of the silent passengers. Why is it, by the way, that the people with the most gratingly awful voices are the ones who feel obliged to shout on their mobile phones to an entire captive train carriage audience? Are they completely unaware of the public spectacle they make of their private trivialities? No, obviously not. They should be told. It is time the silent majority stops being so maddeningly meek, mild, and complacent (rationalising their own inaction in response to justified resentment as some sort of virtuous tolerance, a prime ‘British value' after all), take up arms and actively stamp out these crimes BY WHATEVER MEANS POSSIBLE. And I do mean stamp. These hideous blights of modern life must be obliterated. Give music back the respect it deserves, or get rid of it; let us at least try to make our world a more aurally civilised place. This is scary stuff. It seems to me to be a proof of concept, a dry-run, if you will. There's little reason why we in the US could not be next. I would take any government and business reassurances to the contrary as sanguine nonsense. TALLINN, Estonia, May 18 -- This small Baltic country, one of the most wired societies in Europe, has been subject in recent weeks to massive and coordinated cyber attacks on Web sites of the government, banks, telecommunications companies, Internet service providers and news organizations, according to Estonian and foreign officials here. The Indian billionaire who brews Kingfisher and Mendocino (well, he owns the breweries which do that) has purchased Whyte and Mackay, the Scottish whisky distiller of Isle of Jura, Dalmore, Whyte and Mackay brands, and others. Among many other properties, Vijay Mallya - through his United Breweries Group conglomerate - owns the Mendocino Brewery of Hopland, California. Whyte and Mackay's immediate past owner, Vivian Imerman, said this: "Scotch whisky can only be made in Scotland." But will Mr. Mallya agree, or will he have the same feeling for whisky as he does for beer? Will he distill this mostly water-containing product in out-markets rather than shipping it long distances from Scotland? Mallya has indicated he is interested in purchasing other Scottish distilleries. So, is it the water or is it marketing and cost-minimizing? I feel that personal computers - and all things 'e' - should be simple to use like a light switch: on or off. Users of devices, for the most part don't care about the inner workings of those devices, about the gee whiz technology, they just want the devices to work. Here's another analogy: when you turn the key in your car, you don't need to know how the car works, just how to to operate it and maybe how to conduct simple maintenance. But after (how?) many years since their commercial introduction, PCs still don't have that ease of use, although they are moving snail-like in that direction. Walter Mossberg - the personal technology columnist for the Wall Street Journal - stated it this way, in his very first column in 1991 (as quoted in the 14 May 2007 issue of the New Yorker): "Personal computers are just too hard to use, and it's not your fault." What is DRM? Scroll to the end of this blog for more links. Amazon.com has just announced it is jumping on this (still tiny) fair use bandwagon: it will soon be offering downloaded music without (what I and many other believe to be) heinous digital rights management restrictions. And this from Amazon's Jeff Bezos, who was once quoted as believing that intrinsic ability trumps acquired skills and accumulated experiences! Classless society... ha! But I digress. 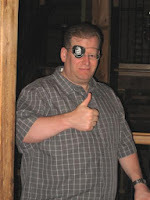 I don't use peer-to-peer sharing networks, such as the old Napster or Kazaa: I don't steal. And, I don't want all that unfettered access to my hard drive. It invites too much danger from spyware, malware, viruses, trojan horses, and the entire menagerie of malicious software. Thus I have been using services such as eMusic which have sold DRM-free music as downloads for a few years. And just last month, EMI and Apple announced a change. Apple will sell tracks without DRM for 30 cents more than copy-protected songs. Entire albums, without DRM, will not cost more. Slowly, step by step, the music industry may be learning how to make money - fairly - in the digital age. SEATTLE - Amazon.com plans to open an online music store offering only songs that are free of copy-protection technology and can be played on anything from PCs to portable gadgets such as Apple's iPod or Microsoft's Zune. The Internet retailer decided to steer clear of digital-rights management technology because consumers want to be able to listen to their music on any device they choose, executives said Wednesday. The market-leading iPod, for instance, can't play copy-protected music purchased from music purchased from Napster or RealNetworks Inc.'s Rhapsody store. A Zune can't play tunes bought on iTunes. All players support music in the MP3 format." Amazon's music store wasn't unexpected, and the company is tearing a page out of Apple Inc.'s songbook by offering music that's not locked down by digital-rights management technology. Like Apple's iTunes Store, Amazon will offer DRM-free songs from Britain's EMI Music Group PLC. Amazon also said it will offer millions of tunes from 12,000 unnamed labels. Apple, however, will continue to sell copy-protected tunes. Amazon said it would announce more labels when the service goes live later this year, but it did not identify a specific date. Songs will be sold by the track or album, without a subscription option. Amazon didn't provide prices. Here are other posts on DRM. 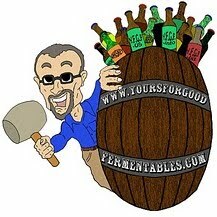 Now ... back to our regularly scheduled blogs on beer (and other good fermentables)! ... is a question I'm often asked. Answering "Territory Manager for Clipper City Brewing" can sound vague. Direct sales - knocking on doors and asking store owners and restaurant managers to sell my beer in their establishments - is part of what I do, as is pouring samples for customers in beer stores. But a more efficient - and greater slice - of my time is encouraging and assisting the sales forces of each of the wholesalers with which which the brewery has an agreement - and Clipper City has different wholesalers in 17 states - to effectively sell our beers. After all, in how many stores, in how many bars, can I actually be? Clipper City has a sales force of only 2! Our distributors' sales forces become the realistic extensions of ours. Monday and Tuesday, Clipper City's sales manager and I were visiting South Carolina to interview wholesalers. As I've posted earlier, South Carolina recently changed its laws to allow beers of greater than 4.9% alcohol by weight to be sold. Thus, our Heavy Seas line of beers - ranging 7% to 11% alcohol by volume - may now be sold in the state. Another very important consideration would be franchise laws. The 21st Amendment to the US Constitution reserves to the states the right to regulate alcohol sales within their respective borders. And Some states mandate that wholesale/brewery contracts (and other suppliers of alcohol) be permanent. When such a contract is signed, it stands almost irrevocable, like a marriage without an option for a divorce. The only exception - like a church-granted annulment -would be if both sides were to agree to amicably split, and the original wholesaler be awarded the equivalent of two or three years' gross sales. Obviously, the choice is not one to be made lightly. South Carolina is such a franchise state - but only for beer, not for wine or spirits. Go figure! Thus, to use that hackneyed phrase: due diligence is required. This truck was parked in the lot of the Columbia , S.C. motel in which we stayed. All of the Republican party presidential candidates were in town to debate the issues later that evening. Was the sign a reiteration of McCain's campaign slogan against President Bush or was it now being used against the Senator instead? 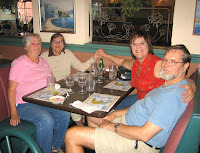 My sister flew in from Nevada to be with my mother today. She and I, with my brother Albert and friend Lynda, drove with my mother to Tarara Vineyards just outside of Leesburg, Virginia, to hold a different kind of celebration of Mother's Day ... well, at least not the quotidian brunch. Tarara: the name of the winery follows a tortuous linguistic path. Owner Whitey Huber and his wife toured the property in 1985, when the 475 acres were a soybean farm. Part of the land lies in a flood plain. And it was flooded that day. Well - a flood, the BIG flood, Noah's Ark, Mt. Ararat. Spell the last backwards, and you have it - Tarara! Wine 'docent' Bill guided us through a tasting of 5 reserve wines. The winery uses a combination of French, Hungarian, and American oak, each reused only 4 to 5 times. French oak, Bill told us, imbues the wine with a honeyed aroma. The Meritage uses only French oak. By the way, the reserve wines are fermented and aged in the oak, whereas a mre common procedure is to ferment in stainless steel. Here's Mom after enjoying her Merlot. The Chardonnay had a refreshing citrusy bite following the expected malo-lactic creaminess. 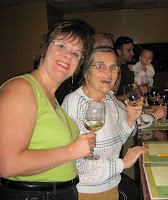 Carol, an avowed ABC-er (anything but chardonnay), was surprised that she liked Tarara's chardonnay. The Merlot at 15.2% abv, was highly extracted with flavors of dark cherry and sweet red bell pepper flavor - Mom's favorite. Carol liked the Cabernet Franc - spicy and full-bodied. Bill told us that Cab Franc has become the specialty of many Virginia wineries. The Cabernet Sauvignon had a wonderful glycerin body (or as that is more whimsically described, legs on the glass). I preferred the Meritage, a Bordeaux grape blend: 45% Cabernet Sauvignon, 35% Merlot, and 20% Cabernet France. It had an earthiness and slight green olive aroma. When we first walked into the tasting room, adjacent to the winery's fermentation cellar, we noticed the strong aroma of fementation, almost like pungent yet sweet cardamom. This was a consistent flavor characteristic across the board. The stone stoop in front of our family house feels warm - under our 'seats' - as the sun is setting. Is it the Tarara wine we're drinking? Or is it the lasagna Lynda cooked? Or is it one of those special moments when life is good? 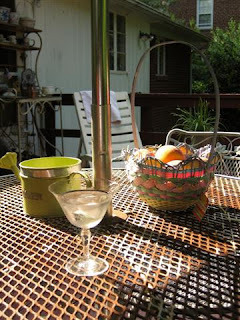 See my post on Virginia's ingenious political solution to assist in-state wineries. Contained herein is my rambling non-sequitur inspired by the day today, by a poem of Don Marquis, and by the below links to a (true) story sent me by a friend. two Moms, and a daughter and a son. man's hand to be against them? If only government were run like a business. Yeah, right! Pure profit motive produces as many inefficiencies - to be euphemistic - as bloated government. Contrary to perceived wisdom, I believe that a Democrat is a Republican who has seen life, learned lessons, and grown wiser ... not vice-versa. I was, and remain, as a person and as a prime minister, an optimist. Politics may be the art of the possible, but at least in life give the impossible a try. Would that our president, even in failure, be so eloquent. 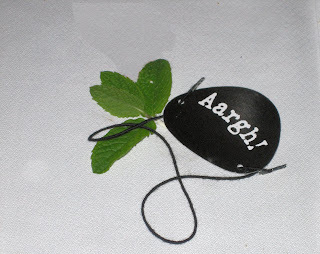 I did warn that this post would be a ramble. 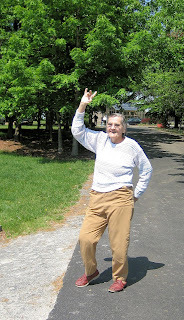 But of greatest importance today: Happy Mother's Day, Mom! Thursday, 10 May, nearly 150 Eastern Shore firefighters battled a large fire at a vacant Cambridge, Maryland, warehouse in the 100 block of Washington Street. The fire at the warehouse -- which at different times had housed a crab processing plant, a brewery run by Wild Goose and an auto repair shop -- took nearly four hours to extinguish. Several years ago Wild Goose Brewery moved from that warehouse to its present location in Frederick, Maryland. Tuesday, 1 May, three employees of Wild Goose were injured in a head-on auto collision. The driver of the other car died. The police have said that alcohol was NOT the cause of the accident. Support Your Local Brewery is a campaign recently organized by the Brewers Association to enlist beer enthusiasts, brewers, and associated groups to act in concert as lobbyists - see, that can be a good thing when it's you! a national, grassroots partnership of beer enthusiasts, professional trade associations, and brewers dedicated to supporting and protecting the legislative and regulatory interests of small, traditional and independent craft breweries. After signing up you will receive alerts as to state legislative issues (and assuming national as well) which affect the craft beer industry and consumers. And you'll be asked to write, or email, or contact, or organize about these issues. The American consumer should have access to the widest range of domestically produced beers made available by licensed breweries. The success or failure of a beer should depend on consumer demand, rather than artificial barriers to distribution. The absence of a willing and/or viable wholesaler should not prevent a small brewer's products from reaching a retailer who is willing to sell them. We support state laws that respect and enhance consumer choice in the marketplace. We believe that to provide the greatest ongoing choice for consumers, small brewers need the right to act as their own wholesaler and be allowed to distribute to retailers. Such brewers should be subject to all laws and taxes applicable to both brewers and wholesalers. We believe that small brewers and wholesalers should be free to establish enforceable contracts between the parties that both parties agree are fair and equitable. Franchise laws were enacted to protect wholesalers from the undue bargaining power of their largest suppliers. Applying those laws to relations between small brewers and wholesalers is unfair and against free market principles. Where franchise laws exist, we believe that any brewer contributing less than 20% of a wholesaler's volume should be exempted from those laws and free to establish a mutually beneficial contract with that wholesaler. Without the leverage inherent in being a large part of a wholesaler's business, a small brewer and wholesaler can negotiate a fair contract at arm's length. We support the independence of wholesalers and believe independent wholesalers are wholesalers who are contractually and economically free to allocate their efforts among the brands they sell without the undue influence of their largest suppliers. Each brand gets the attention it deserves on its own merits in the marketplace. 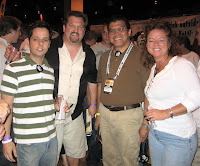 In the past, the Brewers Association has done such things as organizing international trade fairs. And it throws an annual Craft Beer Reception at the US Capitol. This year's reception is in recognition of American Craft Beer Week and will be held on Tuesday, May 15th in the Agriculture Committee Hearing Room (Room 1300) in the Longworth House Office Building. For more information on that, contact Pete Johnson at the Brewers Association. And, of course, there are the Great American Beer Festival and the Craft Brewers Conference. But in many ways, all these things are preaching to the converted. Thus this new campaign is critical: transforming the craft beer movement - after 26 or so years - into a consumer/brewer cooperative interest movement. It's a long overdue but potentially powerful action. 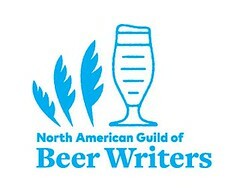 The Brewers Association should be commended ... and you should sign up! Why wineries? As Anchor Brewing's Fritz Maytag put it in the The Beer Hunter: "We are all friends in fermentation." Silhouetted, that's Hugh Sisson, owner of Clipper City Brewing Company , on the left and John Bates, owner of Growlers Pub of the Canton neighborhood in Baltimore, Maryland, on the right. Behind Hugh and John, note the '"No Dogs Allowed" sign on the front door. Dog friendly from the day it opened in 2004, Growlers had just two days earlier been warned by the Baltimore Health Department against allowing dogs on the premises (despite the fact that John serves no food). Nevertheless, John still leaves a welcoming bowl of dog biscuits on Growler's front steps for the neighborhood dogs trotting by with their human companions. The photo was taken Wednesday 9 May at Growlers. Hugh Sisson and most of the staff of Clipper City were there at Growlers to thank John and wife Kristen for their strong support of Clipper City - three of our beers were on tap that day. And it was a brewers' and staff night out, a chance to socialize outside the confines (albeit friendly) of the brewery. Jim McGinty, the new Beer Manager for National Distributing - the principal wholesaler for us in our home state of Maryland - stopped by to say hello and hoist a few pints with us. If you've been to Baltimore's Racer's Cafe within the last 15 1/2 years, you may have noticed one constant - bartender John Bates. John began at this northern Baltimore beer destination (and it's still there, thriving) back in the heady days of the late '80s. Difficult to overlook behind the bar, he was the gentle giant, always informative about the goings-on of the the nascent and burgeoning local beer scene, and always a calming presence in the 'kettle'. But past tense is inappropriate. Pushing the geographical boundaries of good beer in Bawlmer, a new beer friendly bar - Growlers Pub - has staked a claim to blue collar northern Canton. John Bates and his charming fiance, Kristen, have recently set up shop in a place of their own. They rehabbed an old neighborhood Patterson Park bar, rechristened it as Growlers Pub, and began serving at the end of February. There were two taps that day- Sierra Nevada and DeGroens Pils. There's no food as of yet, but John has plans to get the kitchen going by mid-summer. [He eventually decided not to do that.] There's a pool table in the back section. Hours are 2-2 every day. You'll find the pub one block south of Patterson Park at Potomac and Fleet Streets. Where have all the brewpubs gone?, Greg Kitsock seems to lament in his latest Washington Post column on beer. He's not referring to a national demise. In fact, "nationwide, 58 opened and 40 closed -- the lowest number of failures since 1996, according to the Colorado-based Brewers Association." There are currently 975 brewpubs in the US, again according to the Brewers Association. Kitsock is bemoaning the shrinking number - of brewpubs in Washington, D.C. - now a mere three. Kitsock provides a possible answer: it's the rents, silly. To survive the costs of operating in downtown DC, brewpubs or beer-centric restaurants probably need to emphasize food and wine and price to a greater extent than the beer itself. Pretzels and brats and $5 pints just won't pay for rapacious rents. Recently, at a just off downtown restaurant, I found a 750-ml bottle of non-vintage Belgian beer priced at an astounding $60. With all the good affordable wine available these days, I might hesitate to pay that much for a bottle of wine. With all the good beer available in our area - brewed locally or imported - should a beer be at that price? No way! But then again, there are those rents to pay... and the food was good. Try: Wheat beers such as hefeweizen, Bavarian-style weissbier and Belgian-style witbier; pilsners. Try: A Belgian-style saison such as Ommegang Hennepin or Saison Dupont. Try: Clipper City Peg Leg Stout or similar dry, creamy stouts with coffee and chocolate aromas. 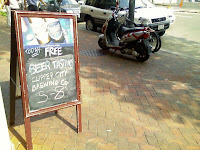 Try: Clipper City's "Red Sky at Night" similar amber ales well balanced between malt and hops. Try: Nostradamus Brown, Urthel Bock or other brown ales. Try: Weyerbacher Hop Infusion or other pale ales with abundant hopping; Anchor Steam. Try: Chimay Grande Reserve (blue label), Celtika Ambre, Avery's "The Reverend Quadruple"
Try: Anchor Porter or other gently sweet, mellow, rounded porters; or nut-brown ales or amber ales. I might have some different ideas for some of Manager Johnna Benson's pairings. For instance Red Sky at Night is NOT an amber ale but a deep golden and spicy saison. I would pair it with goat cheeses. But as I say at the start of all of my beer and cheese seminars: "The first rule of beer and cheese pairing is that there are no rules - only enthusiastic suggestions." Caveat: I, of course, work for Clipper City Brewing Company, even though my opinions and comments do not necessarily reflect the positions of the brewery! I recently received this invitation from Max's Taphouse - one of my favorite places to have cask ale, and one of favorite places to drink beers that I've never had before. A 21st birthday is an important milestone in life. It marks the coming of age, the entrance to adulthood. Now you can drive and vote; you can be married in most civilized states and you’ll hang for your offenses. But most importantly, it allows you to DRINK LEGALLY! Come celebrate the coming of age of Max’s Taphouse, serving the largest selection of beer on the East Coast for Twenty One Years. You are cordially invited to the Max’s Taphouse birthday party. 21 years ... wow! I remember going for music and for Martini nights way back when. Max's remains, even in my travels, a favorite multi-tap pub. Monday, I'll be selling Hugh's beers in North Carolina, so I won't be able to celebrate with you. But I'll do so in spirit. Congratulations and continued (21 more!) years of success. In past years, the Brewers Association (and its predecessor, the Association of Brewers) has promoted an unwieldy month-long celebration of American Beer Month. By definition, that produced the unintended and insalubrious result of praising American mega-brewery beers. Now, it's a much more succinct American Craft Beer Week. Clipper City Brewing Company will be celebrating American Craft Beer Week with several events, including the Brewer's (sic) Association of Maryland Springfest (well that's actually on on Saturday 12 May, 2 days before the week begins), a tour of the brewery on Saturday 19 May, and, sandwiched between the two, a cask ale beer dinner at Magnolias at the Mill in Purcellville, Virginia. Our friends at Max's Tap House will be celebrating for the entire week. Cellarman/manager Casey Hard and bar manager Bob Simko have planned an extensive draft line-up of American craft beers. Click here for more details on Max's celebration. It's a surprise when you dismount your bicycle at the western terminus of the W&OD bike trail in Purcellville, Virginia. Because there you'll find Magnolias at the Mill, a marvelous restaurant converted from a old stone and timber-hewn grain mill. 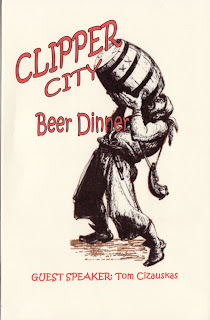 Maggie's (the nickname which the regulars have for their favorite restaurant) banquet manager Kim Ross and Executive Chef Mark Marrasco have invited Clipper City Brewing Company and me for a 6 course beer dinner, pairing their food creations with the beers of Clipper City, on Thursday evening, 17 May. Clipper City Gold Ale (cask): Artichoke, oven-dried tomatoes, and hearts of palm salad. Red Sky at Night Saison: Fried green tomatoes with pistachio relish, tasso ham, and goat cheese. Holy Sheet Uber Abbey Ale: Fisherman Seafood sofrito, with chorizo sausage, saffron, and fried plantains. 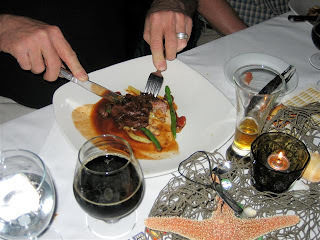 Peg Leg Imperial Stout: Ancho Espresso rubbed Beef Tenderloin with three bean fricassee. Loose Cannon Hop3 Ale: white chocolate-lavender mouuse with blueberry parfait. I'll be tapping a fresh cask of Clipper City's Gold Ale ... and using the opportunity graciously given me by Kim and Mark to give a mini-lecture on cask ale. This beer, in its cask version, comes close to tasting like a British best bitter. The draft that evening of Holy Sheet Uber Abbey Ale may be the last anywhere (including at the Clipper City brewery). The abbey ale was our spring seasonal and won't be brewed again until 2008. Many beer dinners end with a stout, usually accompanied with fruit (contrasting taste) or chocolate (complementary flavor). Instead of that, Andrea, Magnolias Mill's pastry chef is pairing our IPA - an exuberantly herbal and aromatic beer - with a white chocolate-lavender mousse and blueberry parfait. Can't wait! 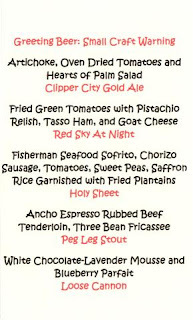 The dinner is an 'official' Clipper City event as part of the week-long celebration of American Craft Beer Week. For more information and to make reservations (required), click below.